Hard water can clog pipes, make it difficult for soap and detergent to dissolve, and leave behind water spots. It can also cause a scale build up in your water appliances that will decrease the efficiency of your water heater, causing an increase in energy costs. 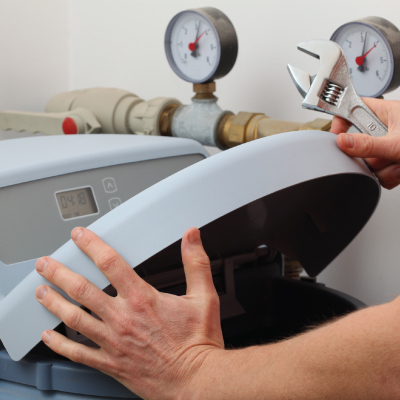 Water softeners have many advantages such as low maintenance, affordability, and water/energy savings. Because of the salt in the water, you will not need to use as much soap either, also saving you money and protecting your skin. Not only that, but it will make your silverware, glassware, mirrors, and tile shinier and cleaner, soften your clothes in the washing machine, and even increase the life of water appliances such as coffee machines, ice makers, dishwashers, water heaters and laundry equipment. Top Dog Plumbing can help you choose the right water softener for your home and install it affordably and quickly.